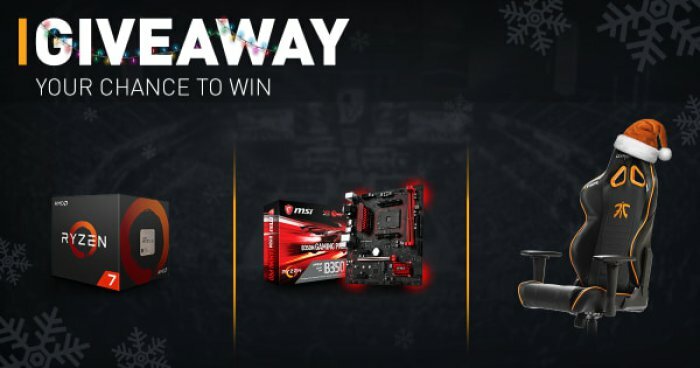 Fnatic has teamed up with AMD, DXRacer and MSI to gift one of their fans with one of amazing gaming prizes! To enter in this Ryzen 7 1800X, B350 Gaming Pro Combo and Fnatic Racing Edition Chair Giveaway grab your free entries by following few simple steps listed down below! The MSI B350M Gaming PRO motherboard combines robust performance with superb quality and stability MSI is renowned for, creating an unbeatable cornerstone for your next power house. It supports DDR4-3200+(OC) memory, features 32Gbps NVMe M.2 slot and native USB 3.1 Gen1 connectivity, and is built with Military Class 4 components for the best protection, efficiency and durability. Based on AMD B350 chipset, the B350M Gaming PRO works flawlessly with AMD RYZEN Series processors and 7th Gen A-series / Athlon Processors in AM4 packaging. It also boasts bold aesthetics, and has the ability to connect and customize various LED lighting solutions, giving you endless options to create a gaming rig of your own. Customize and set up your own color scheme with RGB Mystic Light Sync. Select any of the colors from the palette using your smartphone or the MSI Gaming App to match your system style. Bored of the same colors? Simply change the complete look of your system in 1 second! This GAMING motherboard features LEDs on the back which provide a cool GAMING glow inside your case. Like war paint, turn them on for a more immersive gaming experience and amp yourself up, ready to dominate the battlefield. Fnatic shall notify the winners via E-mail within two business (2) days of The Giveaway draw with the tickets.